To meet the need for faster and quicker inter-city travel, expressways are coming up in various parts of the country. We tell you how to ensure a safe expressway journey. India boasts of one of the largest road networks in the world, over 43.2 lakh kilometres, with highways-national and state-accounting for 2.09 lakh kilometres. Despite this extensive network, the maximum speed on Indian highways remain as low as 80kmph. Add to this the fewer number of lanes and the combination leads to sluggish flow of traffic . The growth of the Indian economy needs faster roads and quicker delivery of goods. And so expressways were designed. The first one was built 10 years back, connecting Mumbai and Pune. Following this, the Ahmedabad-Vadodra expressway was constructed. More came up after the success of the two projects, the most notable being the Yamuna Expressway connecting Greater Noida to Agra that allows users to cover the distance of 165km in a little over two hours at a maximum speed of 100kmph. These fast roads have aided in quicker inter-city travel , but faster also means there is a need for extra caution. And because expressways cut through otherwise deserted areas, following the rules can ensure you have the best experience. We often come across electronic billboards that remind us 'lane driving is sane driving'. However, maintaining lane discipline is an important rule many ignore. Due to congestion on city roads, where almost every inch of the road's surface is occupied by some vehicle, it's virtually impossible to drive in lanes. On expressways, however, it's different. Fewer vehicles use them and the lanes are marked out for a specific purpose. There are some basic rules. First, the extreme left lane is mainly for the use of heavy vehicles. You should move to this lane only if you are trying to get to the breakdown zone, usually located on the extended hard shoulder of the road. The middle lane is meant for vehicles that are cruising, maintaining a constant speed. The extreme right lane is meant for overtaking and vehicles accelerating ahead. Lane driving is the first and the most important step towards safe driving on these roads. Speed limits are there for a very good reason. An expressway is not where you should imitate a racing car driver even though you might have an irrepressible urge to do so. Speed limits help regulate the flow of traffic and ensure safety. Most expressways in the country have a speed cap of 100kmph. For some it might not seem much to do with on modern engines but the limit on expressways is twice as much as in the city. This also means you need to increase the distance between your vehicle and the one in front as braking distance is also greater at higher speeds. It could be the difference if you need to make an emergency braking. Maintaining the speed limit is advisable for safe driving on any road, of course except maybe on a racetrack. 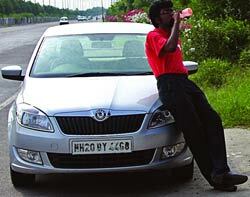 Travelling on expressways can get monotonous and tiring, especially if you are alone. Boredom can also set in as the landscape changes very little and there is not much about to keep you alert. This can result in a lapse in concentration. You should keep your car's window open to keep you awake. In case you do feel drowsy, it is best to pull up and park in the designated layby area for some rest. These areas are located at various points along the route for this specific purpose. Wash your face and eat something light, such as chocolates or biscuits that provide instant energy and drink water or juice to hydrate yourself. Rest for a while before carrying on with the journey. One never knows when a mechanical failure may occur. Having a breakdown on the expressway can be dangerous, especially due to the fast-moving traffic. In case your car does breakdown or you have a problem, put the hazard lights on immediately and try to get to the designated breakdown area. You will usually find emergency numbers listed at these points that you can call for assistance. 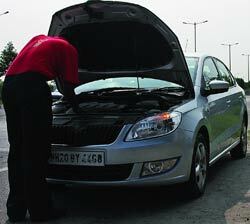 If you are stranded between two breakdown zones, try to pull up beyond the extreme left lane. If your car is immobilised in the middle of the road, put on the hazards and set down the warning triangle (something you must carry) at least a 100 metres behind your car. Apart from the helpline numbers at breakdown zones and layby areas, there are other facilities available as well. Most expressways have restrooms and emergency phones at regular intervals. Also, along the way you will find fuelling stations along with convenience stores that are open round the clock to serve needs of motorists. If you run into problems, you can also check at these places and ask for assistance. Though the staff there may not be able to help you directly, they can help you in reaching the right people.